I’m an early-stage investor and would appreciate introductions to teams on your platform that are ready to raise outside capital, can you hook me up? Yes. Send a quick note to hello@startuprocket.com and tell us more about yourself (and your fund, if applicable) and we’ll get you on an appropriate distribution list. We’d encourage you also to send founders our way that are having a hard time raising capital (and/or you think could use extra coaching). I’m aiming to start a small business (coffee shop, yoga studio, dental clinic, wedding photography biz, construction company, etc…), is Startup Rocket still applicable for me? Yes. Absolutely. 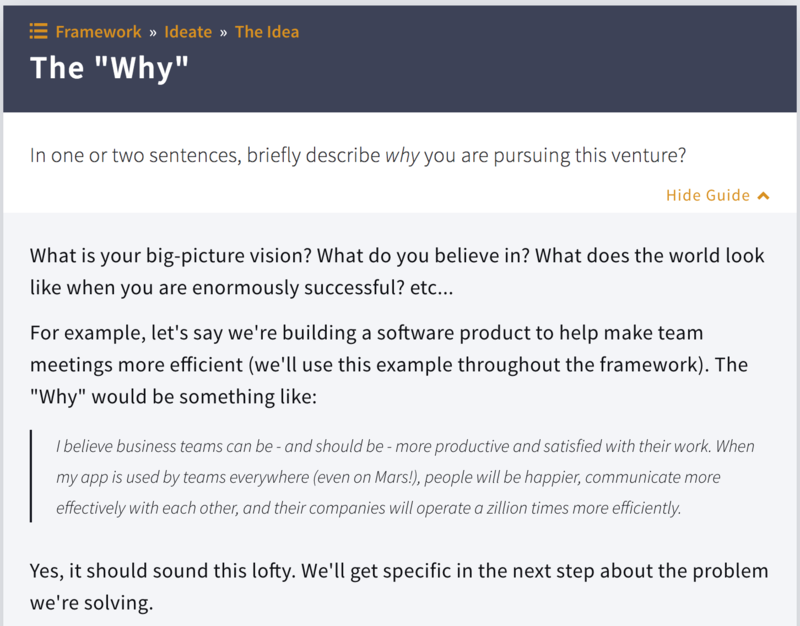 The foundational work in the “ideate” and “validate” sections is critical for all entrepreneurs. 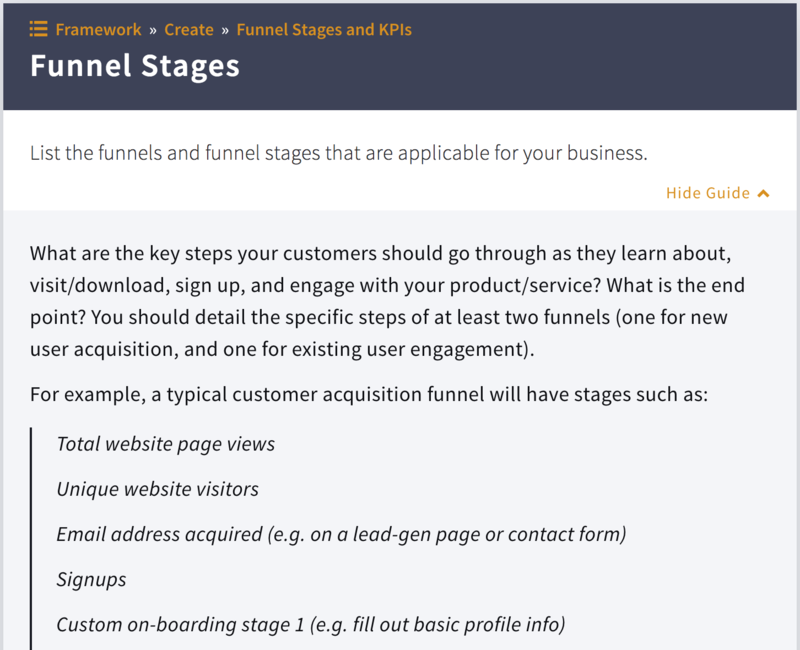 While some of the specific steps in our “Create” section are geared toward software companies, the principles still very much apply for all business types. When you see the word “Product”, you should think about the end-to-end service experience you are providing your customers. 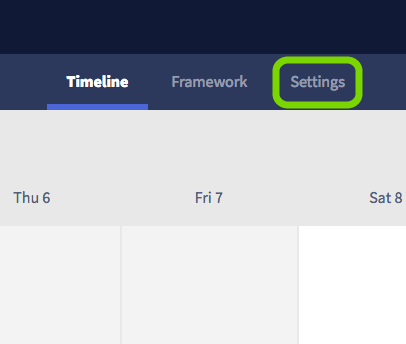 For example, the UI spec, UX flow chart, style tiles, etc... can be applied to your built environment and your web/digital experience. I’m starting a non-profit, can I still use Startup Rocket? 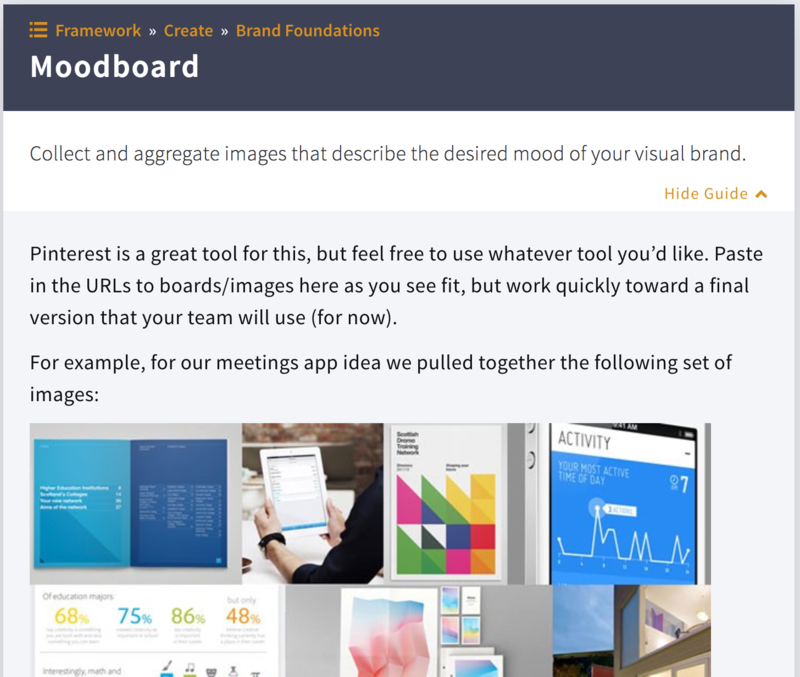 Our team has a ton of non-profit experience, and we highly encourage Executive Directors and their boards/teams to use our framework and platform. Frankly, your donors will appreciate that you’ll have your act together regarding your financial model, metrics/KPIs, strategy, etc... This will help refine your vision/mission and optimize operations to achieve your desired outcomes more efficiently. What are organization codes? How can I obtain one? What information is shared? Organization codes allow you to gain access to the coaching guides and share information about your venture(s) with a co-working space, incubator, accelerator, educational institution, government agency, angel investor, and/or venture capital firm. 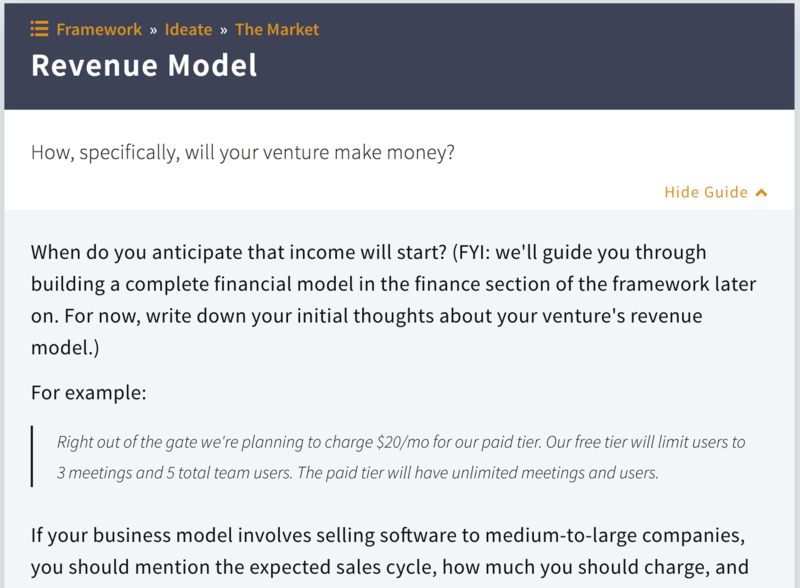 This feature is designed to help an organization better assist, mentor, and potentially fund your venture (as applicable). After entering an organization code, you'll be shown the specific permissions that the organization is requesting to see. For some, part or all of the permissions will be required. 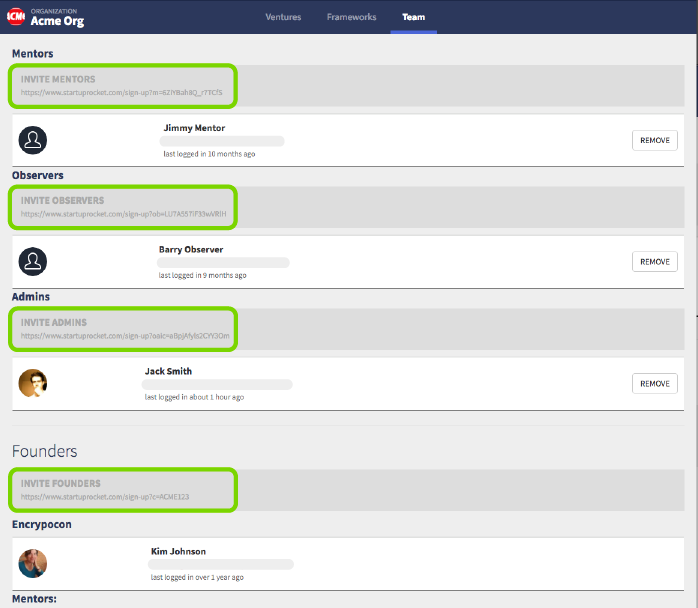 By default, an organization will be able to see your venture name, description, and team. 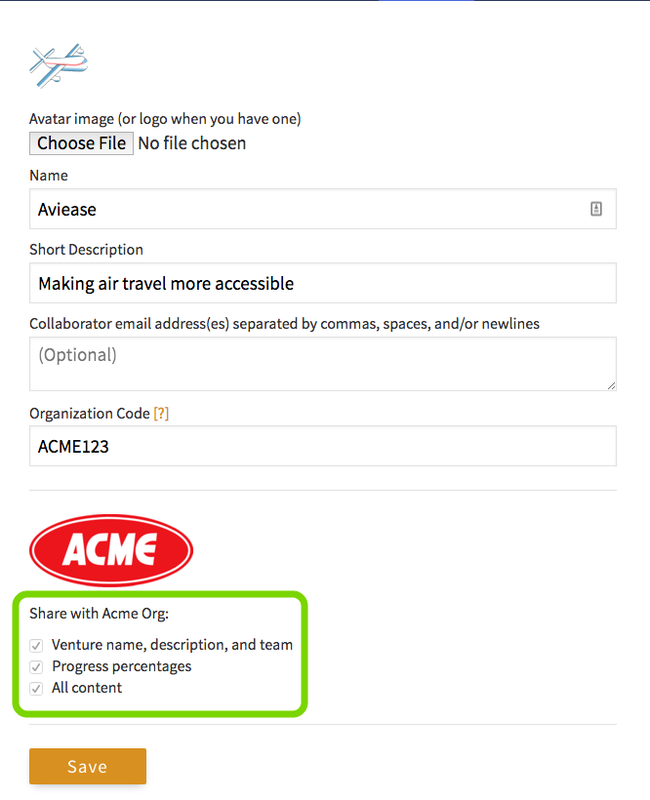 Other permissions include sharing your percent progress numbers throughout the framework, and sharing the content that you and/or your collaborators enter at each step. Click here to download a PDF with more information about Startup Rocket Organizations and how to get started. How do I add an organization code to a venture? 1) Get the Organization Code from your organization's admin. 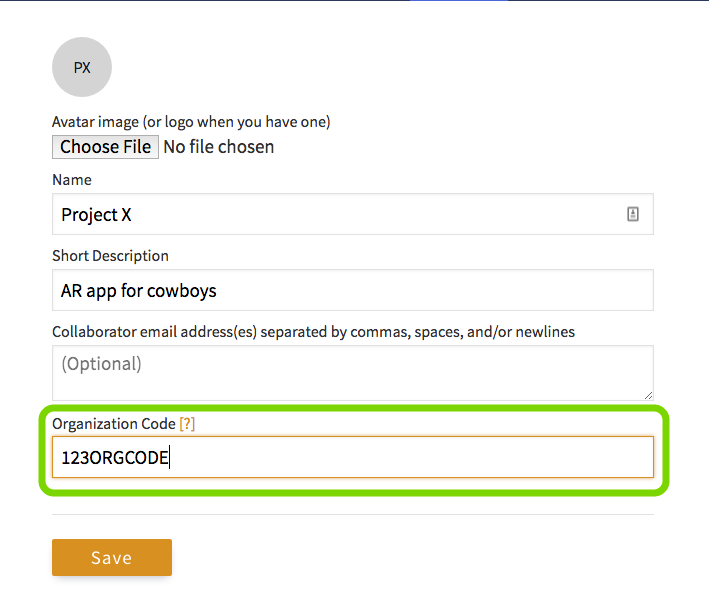 3)Enter the org code into the "Organization Code" field. How Do Organization Invites Work? Startup Rocket for Organizations allows you to invite Founders, Mentors, and other org Admins to easily collaborate on ventures. Whenever someone in an Org creates a new venture, the Venture's Name, Description, and Team will be shared with Org Mentors and Admins. Founders have the option to also share progress percentages and/or all content. Org members will get an invite to the Startup Rocket Slack group and will automatically be added to the Org's private slack channel. When someone visits the Founder Invite URL, they will be given an account from the Org's pool of users. When they create a Venture, the code for the Org will be pre-filled into the Organization Code field. Org codes can also be entered manually whenever anyone creates a new venture. When someone visits the Mentor Invite URL, they will be added to the Org as a Mentor, invited to the Startup Rocket Slack group, and will be given an account from the Org's pool of users. When someone visits the Admin Invite URL, they will be added to the Org as an Admin, invited to the Startup Rocket Slack group, and will be given an account from the Org's pool of users. This will give them access to Founder, Mentor, and Admin invite URLs. How does the referral program work? How and when do I get paid? Your referral link and click/sales stats can be found on your profile page. Customers that refer other customers to our Framework Plan will earn $2 USD (after the 7 day guarantee window has passed). Once the balance reaches $50 USD or more, payouts are made via PayPal at the end of the month. To receive payouts, residents of the USA are required to provide tax identification (EIN or SSN). Read more about the full details of the program within our Terms and Privacy page. How private is the content I’m putting up on your platform? I’m nervous about writing in all my business ideas and their details. I'm on the Starter (Free) Plan. I'm curious about what the coaching guides (tips and examples) look like before I upgrade. Can I see some screenshots? ^^ You get the idea. Each guide provides an example, discussion around common questions that come up on the topic, and coaching tips that will help point you in the right direction and save you time. I’m considering upgrading to get more coaching help, does the 7-day money-back guarantee apply for upgrades? How does that work? Yes it does apply. The way it works is that the system will have you pay the pro-rated amount for your billing period, then pick up on the full upgraded tier price for the next billing period. If you decide to cancel that upgrade within seven days, we’ll refund the applicable upgrade amount. I'm outside the USA, can I still use Startup Rocket for custom coaching help? While the nuances of the "legal" and "regulatory" sections of the framework may be outside of our expertise in your country, most of the principles are universal. As long as we can understand each other (i.e. we only have English speaking team members at this point), and as long as we can process your credit card (most countries should work fine), then we're good to go.